John Mitchell, Jr. edited and published the Richmond Planet newspaper from one year after its founding in 1883, until his death in 1929. He was known as the “fighting editor” for his writing against racism. In 1863, John Mitchell, Sr. and his wife Rebecca were living on the Lyons family estate in Henrico County, Virginia, near Richmond. The Mitchells were slaves; John was a coachman and Rebecca was a seamstress. On July 11, 1863, they had John, Jr., the first of two sons. After the Civil War, the Mitchell family moved to Richmond, where Rebecca and John, Jr. continued to work for the Lyons family. Mitchell graduated high school at the top of his class in 1881. He taught in Virginia Public Schools until state politics led to the firing of many black teachers, including him. 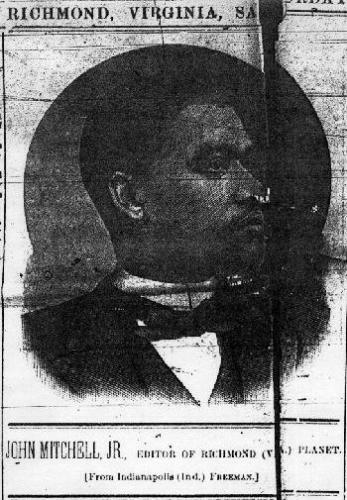 In 1883 the black lawyer Edwin Archer Randolph founded the Richmond Planet. After just a year, the newspaper was in the red and on the verge of collapse. Mitchell led a group of former teachers who resurrected it. The Planet reached its zenith of popularity during a trial that Mitchell covered aggressively. In 1895, three black women were charged with the murder of a white woman based solely on the testimony of a witness who changed his story several times. The prosecution eventually dropped the charges, and even the white press acknowledged the Planet’s role in the outcome. Mitchell investigated lynchings, advised blacks to arm themselves in self-defense, and editorialized against the Spanish-American war, saying it would make Cubans and Filipinos subject to the racism that dominated the South. Mitchell served as a delegate to the Republican National Convention in 1888, and served from that year until 1896 on the Richmond City Council. He opposed the disfranchisement of black Virginians in 1902 to no avail; his political career then ended. His writings implied that his 1921 run for Virginia Governor was conceived mainly as an irritant to whites. He came in a distant third on Election Day. In 1902 Mitchell opened the Mechanics’ Savings Bank in Richmond. Its deposits hit an all-time high of over half a million dollars in 1919. Three years after that, the bank failed. A jury found Mitchell guilty of fraud and theft in the bank’s collapse. The convictions were overturned, but Mitchell’s political and editorial influence was greatly diminished. Mitchell died of kidney disease and in debt on December 3, 1929. Carl Murphy bought the Planet and renamed it the Afro-American and Planet in 1938. The paper continued publication until February 10, 1996. In June 1996 the Richmond chapter of the Society of Professional Journalists honored Mitchell with the George Mason Award. The award acknowledges Mitchell’s contribution to freedom of the press. Ann Field Alexander, Race Man: The Rise and Fall of the “Fighting Editor,” John Mitchell Jr., Charlottesville: University of Virginia Press (2002); Richmond Planet, Richmond, Virginia (1884 – 1929); William J. Simmons, Men of Mark, Cleveland: George M. Rewell & Co (1887).